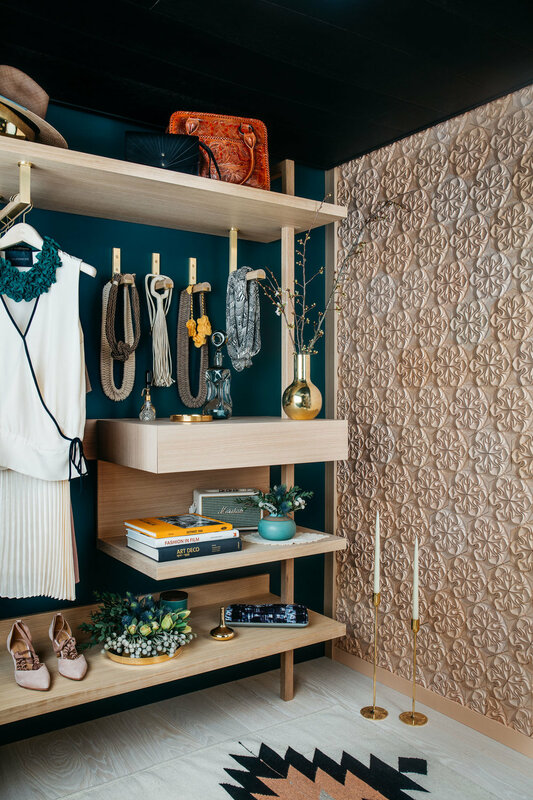 SF Decorators Showcase — MODTAGE design. Inspired by the past, enchanted with the present - a room that blends the vintage treasures of days gone by with the fresh allure of days to come. A tranquil and meticulous styling room awaits, where she prepares her daily ensemble while enjoying a calming space, far from chaos and clutter. Entering the room, a mix of natural materials and handmade elements greet her, carefully planned and placed. To the right lies a stunning textural tile, handmade by artisans in Bali, each piece carefully and precisely placed. To the left, blackened oak panels are sculpted to follow the natural growth curves of a tree as they flow up the walls and across the ceiling. An exquisite vintage chair provides a restful repose as she contemplates the day ahead. The open wardrobe transforms her clothing and accessories into an exhibit, beautifully displaying each element of her wardrobe. The rich backdrop provides just a hint of masculinity, while still allowing all her finery and femininity to shine through. A beautiful blend of both vintage and modern pieces are layered throughout the room to compliment her unique style - a style that is anything but ordinary. Recalling the words of her favorite style icon, she smiles as she prepares her day. Her mantra?